The Lower School years are full of energy and excitement as strong foundations are laid for life-long learning. Our Lower School curriculum is built upon proven brain-based and educational research, and we are consistently amazed by what our students can accomplish. 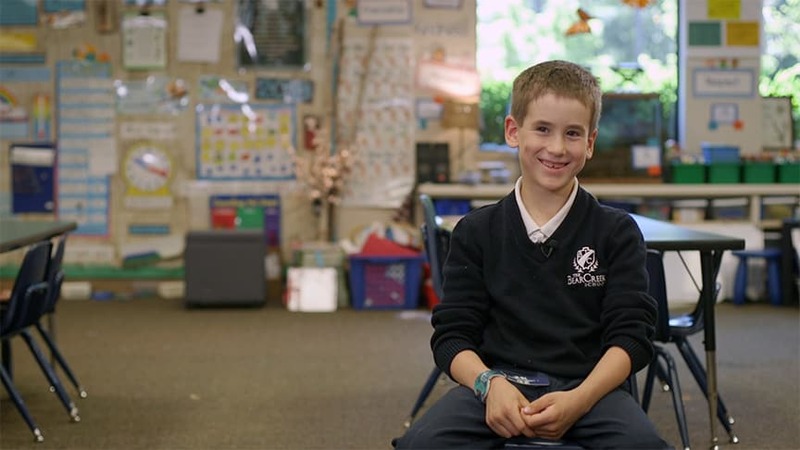 We asked a few Lower School students what they love about Bear Creek. Our curriculum is intentionally designed to encourage the right level of challenge for each student. A priority for each teacher is building a warm and caring classroom community where students feel safe and secure. Our math acceleration program is unique and distinctive. Students are not solely placed in math class by age; instead, each is assessed and allowed to advance to an appropriate class which matches his/her individual aptitude and development. Math classes are offered simultaneously in the Lower School so that students move to their ability-level classes for that instructional period. Students thrive when allowed to advance according to their ability, and not held back by age or grade level. The Bear Creek School received the Association of Christian Schools International (ACSI) Exemplary School Programs Award for our Shakespeare Immersion Program. Students in grade 4 investigate and experience theater by studying and performing classical Shakespeare. All Lower School students attend these drama performances. This unique window into the world of Elizabethan drama provides an exceptional platform to teach about the human condition and make substantive connections to biblical themes while equipping young students with the skills to perform. A science specialist is dedicated to preparing our young scientists in the Lower School. From exploration to engaging the scientific method, students refine discovery, analysis, and research skills. The annual Science Fair is a culmination event for the entire community, where students display and present their scientific discoveries. Grade 3 students exhibit a research paper and visual presentation board. Learning Latin helps students better understand English vocabulary and complex grammatical concepts. Latin also improves analytical and problem solving skills and exposes students to culture and linguistic history. Students in grades 3-4 receive Latin instruction which provides an excellent foundation for future language acquisition. Latin instruction is continued through grade 8 at Bear Creek.